ChristmasInLansing.com, the new website created by South Lansing Christian Church. Our church created it as a gift to our community. 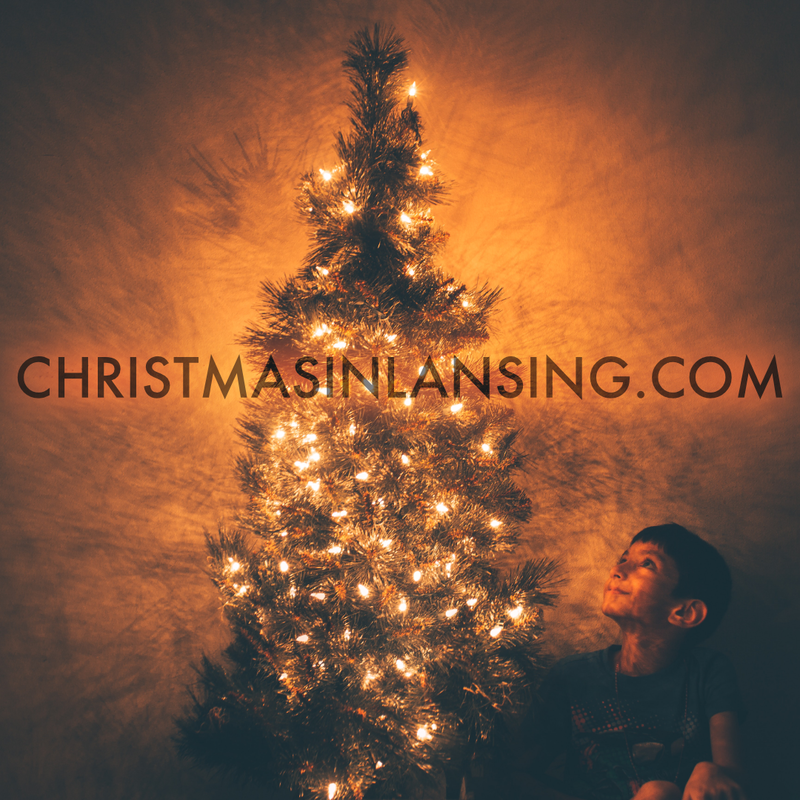 We wanted to have one place where Lansing residents could go to find the best holiday traditions the Capital City has to offer. Sorted into five categories, including Family Fun, Arts and Music and Christmas Worship, there is something for everyone. In recent years I have tried to avoid divisive political issues. As a Christ follower commissioned as a pastor, my passion is to reconcile people to Jesus. To that end, I don't want to create barriers between me and someone who doesn't know Jesus. Though I try to carefully calibrate what I post on Facebook (I don't always succeed), I feel a bit more freedom to address such issues in this forum. With every firearm in my gun safe I ask, "Is it a tool or a toy?" Every firearm I own is a tool. My family has shotguns and large caliber rifles for hunting. None of them are semi-automatic. We do own a semi-automatic .22 caliber rifle for target shooting. It is used for practice so we can become more proficient with our deer rifles. As a small-bore rifle it is not considered a deadly weapon in the same sense as large-bore semi-automatic rifles. We also have handguns. Two are .22 caliber target pistols; two are for home defense. Every firearm we own is locked in a gun safe. Ask firearm enthusiasts why they want to own at AR and though it might take a bit to get to the root reason, it boils down to this: They're cool. I want one. And the Second Amendment says I can have one. Some claim, "I hunt with it." Many do hunt with modern sporting rifles, I agree. But anything a hunter can do with an AR-15 can be done with a rifle like the Remington Woodmaster 750. It is a semi-automatic, large-bore centerfire rifle that does everything a modern sporting rifle does except look cool and serve as a platform for extreme military-style customization. You will never see a Woodmaster in a Call of Duty video game. They're not nearly cool enough. Some will say, "I want an AR for home protection." Most gun enthusiasts – AR owners included – admit it isn't the best choice for home defense. Rounds from an AR can pass through walls and harm the very people you're trying to protect. Larger than a pistol, it is less maneuverable in tight quarters like a bedroom hallway. If one insists on a long gun rather than a pistol, home defense experts agree that best long gun for home protection is a slide action shotgun, commonly referred to as a pump shotgun. For one simple reason: the sound it makes when a round is chambered. My police officer friend once told me, "When a thief is climbing through your window and he hears someone rack a pump shotgun, he s---- his pants!" The other widely-used argument in favor of AR ownership is this: we need the AR to protect Americans from government tyranny. I am not a historian so I will leave the merits of that argument's second-amendment premise to constitutional scholars. That being said, we long ago passed the point at which a well-regulated militia could seriously challenge the United States military. The modern infantry soldier employs body armor, night-vision capabilities, advanced communication, specialized tactical training, and a military version of the AR-15 that is capable of fully automatic gunfire. That – together with grenades, mortars, mines, tanks, missiles, and aircraft – pretty much ensures that citizen militias armed with modern sporting rifles would be only slightly more effective against the most powerful army on the planet than my buddies and I armed with our duck hunting shotguns. So, to review: there are hunting weapons that are equal to or superior to the AR; there are home defense weapons that are superior to the AR; and, the argument against a tyrannical government is specious. There is really only one argument in favor of the AR that is irrefutable: I want one and the constitution says I can have one. Is it legal? Yes. Is it your right? Yes. Are the massive majority of AR owners responsible and incapable of committing illegal, let alone heinous, acts with their firearms? Yes. That being said, there is a word for someone who insists on possessing a toy simply because he wants one: a child. When a child exhibits that kind of behavior we call it childlike. But too many gun owners embroiled in the AR debate stamp their feet and with red faces insist on their rights. In adults we call that kind of behavior childish. I doubt that banning so-called assault rifles will stop mentally deranged Americans from killing other Americans. The problem is far more complex and will require multifaceted solutions including increased mental health funding, increased age restrictions for firearm purchases, parents who actually parent, and a complete rethinking of the way gun violence is glorified in movies and video games. All of those are possible solutions that need careful consideration and could be enacted, I believe, without infringing on my right to own firearms that serve as tools rather than toys. To my fellow firearm owners who stand on their constitutional right to purchase modern sporting rifles my question is this: Can you demonstrate for me how an AR serves you as a tool? The vast majority, I think, will be hard pressed to demonstrate a need for an AR-15. Lacking the ability to demonstrate its utility, I must therefore assume that you must simply want it. It is difficult for me to understand how wanting a toy – one that can be used to commit rapid-fire murder, anyway – is morally defensible as a singular justification for owning one even if it is legal to do so. If restricting AR ownership is the price I am asked to pay for a child to feel even a little bit safer in his classroom, as an adult I am willing to pay it. When I arrived as a fresh-faced, newly minted preacher at the Butler Church of Christ twenty years ago, it didn’t take me long to realize that Angie Uber knew a lot more about being a church secretary than I did about being a pastor. 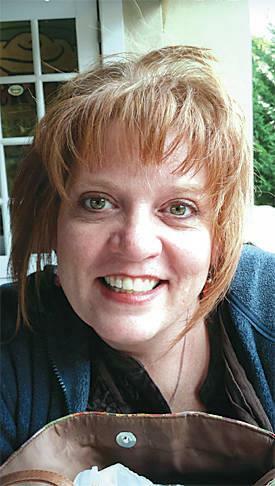 Angie passed away last week at age 48. Cancer might have defeated her body, but I feel certain that her spirit thrived. The truth is, I probably never would have gone to that church if it wasn’t for Angie. It had only been a few weeks since Brother Dale resigned before I applied for the position. The fact is, the church hadn’t even advertised they were looking for a new preacher yet, but I knew Dale, heard he had left, and called him up. He told me to go for it, so I sent a cover letter, a resume, and a couple of propaganda pieces that I thought would make me look better than I really was. Angie was the first person at the church to see the envelope. As I recall, she didn’t even open it, but it was obvious from the shape and the addressee that someone was applying for the job. She could have tossed it in a desk drawer – they hadn’t even begun taking applications, after all. But, as she later told me, she sensed the Holy Spirit telling her she should take my resume to Terry Ulm’s house where the elders were meeting that night. She went out of her way – about ten miles out of her way – and interrupted the elders with her you-aren’t-going-to-believe-what-I-have-here story. Ron and Angie, and their children, Josh, Cameron and Kaitlin welcomed us into their Butler Church of Christ family. Their kids became friends with ours. My wife, Tracy, and Angie commiserated about the challenges of “dealing with Frank,” one as a wife, the other as church secretary. Angie’s office was a nonsense-free zone., and she tried hard to train me right. When I was annoying, she told me so. When I was unreasonable, she told me that, too. Between my red beard and her red hair there existed the potential for some hot tempers, but I don’t recall that there ever were. (She might tell you differently, but that’s how I remember it.) Any peace that existed between us was because she wasn’t just passionate about her faith, but also because she embodied the grace of the One who was the object of her faith. Those were some challenging days for our church, and I couldn’t have navigated them without her. She knew everyone in town. She knew their families, where their kids went to school, what jobs they had, and where they went to church (or didn’t). She became the standard by which each of the secretaries I have been privileged to work for is compared. 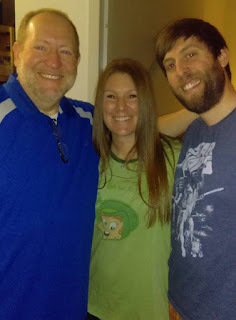 And even after her family moved away, and after our family moved away, Angie and Ron continued to bless the ministry of the Weller family by supporting the work of my missionary daughter, Abigail. Angie and I haven’t seen each other in years. Though the Weller women stayed in touch with the Uber women, my path and her path diverged. And yet, I miss her more now, knowing that she is gone. She is not gone; she has gone on. Gone on to see her faith become sight; her hopes become fulfilled; her devotion rewarded. In the 175-year-old building that housed our church, our offices were adjoining, separated only by a door. And, really, that’s a little like the way it is now. Angie’s home and mine are separated by death’s door. On this side is the pain of saying goodbye, the heartache of all the “ought-to-have-beens,” and family and friends who long for one more conversation, one more touch, one more moment with her. But, even though I miss her, I don’t wish her back. I’m a lot older than I once was and, hopefully, a little wiser. I know that on Angie’s side of death’s door there is “no more death or mourning or crying or pain,” for God has wiped away ever tear from her eyes. And when her closed eyes opened, and her cancer free mind cleared, she was with Jesus. And that is just as it ought to be. The day before my friend Paul died from his two-and-a-half year battle with cancer, I stopped by his hospice room. It was a Sunday afternoon and I was leaving for Australia the next morning. It was just like Paul to take credit. Three months earlier and we would have both been laughing about his joke. That prayer has been answered in lots of ways. It was answered Sunday when Bill and Jenny gave their lives to Christ and were baptized. Bill and Jenny have been gathering with us at South Lansing Christian Church in the weeks since Paul’s death. They're plugged into a small group, and their small group leaders, Chris and Kathy, talked with them last week about what it means to follow Jesus, and why those who do are baptized. And so, Sunday morning at 10:15, Bill’s sin and Jenny’s sin was washed away. They received the gift of the Holy Spirit. They were promised eternal life. Make that, the angels, plus one: my friend Paul. The Lansing State Journal reported today on the photo-copied note you sent to mosques throughout the U.S., including a mosque right here in East Lansing, Michigan. I'm guessing you have another ream of them all stamped and ready to deliver. (Did you use an American flag stamp?) But for the benefit of others who might not have read your tripe, I will post it here. I don't know who you fancy yourself to be, but let me tell you who you are not. In fact, Jesus said, "They will know we are Christians by our love." Based on that definition, you don't make the cut. So please don't intone, "God Bless the USA" and claim to be a Christian. You're only making the rest of us look bad. Never let yourself be persuaded that any one Great Man, any one leader, is necessary to the salvation of America. When America consists of one leader and 158 million followers, it will no longer be America. Patriots do not fear immigrants. They foster them to become Americans. Like someone did your ancestors. You're a coward. 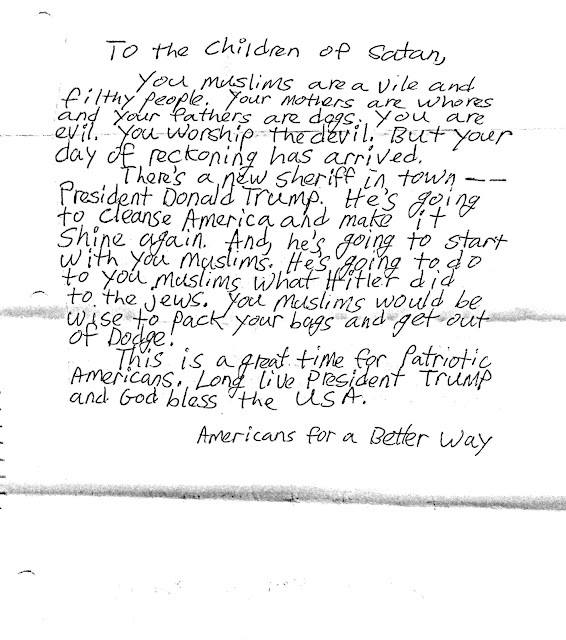 A handwritten letter? An unsigned letter? I can picture you hunkered down at a Kinko's furtively glancing about, wondering when CIA operatives were going to high rope down from the black helicopters. You're a wimp. A feckless, milksop, namby-pamby weakling. Strong words? Yes, but keep in mind that I'm not calling for any ethnic cleansing. If you think you can bring your hatred to East Lansing, you'd better come with more than your nameless scrawling. If you're going to attack our neighbors - whatever race or religion - you're going to have to go through the rest of us. We stand together in Lansing, Michigan. And your hatred isn't welcome.